Now that Strikeforce bantamweight queen Ronda Rousey has her first title defense tucked under her bling-bling belt, Rousey wants to arrange a blockbuster bout against Cristiane “Cyborg” Santos. However, it appears the former featherweight champ might not be willing to shed the 10 pounds Rousey is demanding her to. 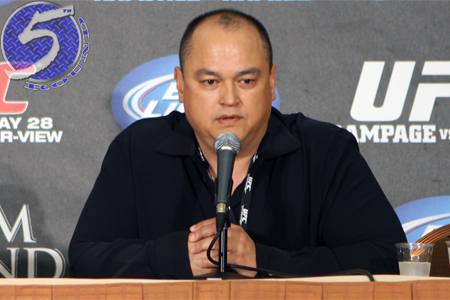 The man who has the power to arrange the tango – or might not have the authority, depending upon who you ask – is Strikeforce CEO Scott Coker (Pictured). The only problem is Coker doesn’t seem too anxious to get the ball rolling on the most anticipated scrap in women’s MMA. “That’s a fight that we definitely have on the radar,” Coker stated Saturday. “I think Ronda clearly said she wants that fight to happen, but as you know, Cyborg is on suspension right now and until she gets off we don’t really have a fight. Quick, someone tell Coker that just because Cyborg is serving a year-long drug ban doesn’t mean they can’t begin the persuasion processes of having her drop to the bantamweight division now. I won’t even mention the fact they should have discussed the transition with Cyborg back in January after UFC president Dana White stripped her of her crown and claimed the featherweight class was pretty much killed. Oops, did I write too much? In any event, it’s the only box office female fight available and Coker definitely wants it to happen. He professes it would set a new standard for the ladies. “I think that records are meant to be broken,” Coker added. “I think the [Gina] Carano/Cyborg fight was the highest rated MMA show on Showtime until we started the heavyweight tournament in February of last year. So for two years, that held the record. Cyborg is eligible to reapply for licensing as early as December 17th. That gives Rousey four months of rest and prep time for the toughest challenge of her career. The timing is perfect. Let’s strike while the iron is hot. What do you think, Scotty?